Gareth is a Chartered Legal Executive at CFG Law with over 13 years’ experience working within personal injury. Gareth has experience of working for both Claimants and Insurers, leaving him with tactical knowledge of Insurance companies and Defendant personal injury firms, which can be very beneficial to his clients. Gareth has considerable experience in dealing with claims arising from a wide variety of injuries including the more usual orthopaedic injuries to the more unusual physical and psychological. 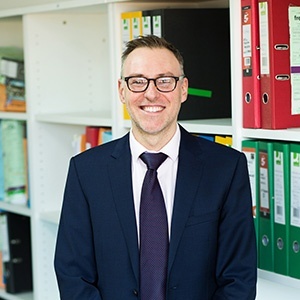 Gareth has a special interest in assisting bereaved families in obtaining much-needed compensation following the accidental death of a loved one. Gareth also has a wealth of experience in dealing with claims against the Ministry of Defence on behalf of injured service personnel. Gareth prides himself on being thorough when considering complex legal issues; however, his main passion is in providing help to people, and he finds this aspect of his job particularly satisfying. Listening to clients to identify their needs and building a good working relationship with them to formulate a holistic approach. Developing progressive relationships with opponents for the benefit of the client. Identifying the key legal points early on in a claim to progress claims effectively and expeditiously. Helping clients to obtain the justice and compensation they deserve to move on after an injury. Working with a group of professional and caring solicitors who are serious about putting clients first. Working for the injured party; not for the insurer! Helping clients with complex psychological needs arising from trauma. Obtaining justice for bereaved families. Travelling around Spain, often with my dog!